Forget running downstairs to where you left your iPhone, take the call on your iPad or iPod instead (as long as you have later-model devices running iOS 8). Make sure both devices are signed into Facetime with the same Apple ID. Make sure iPhone Cellular Calls is turned on in FaceTime settings. If your carrier offers Wi-Fi calling on your iPhone, turn it off. 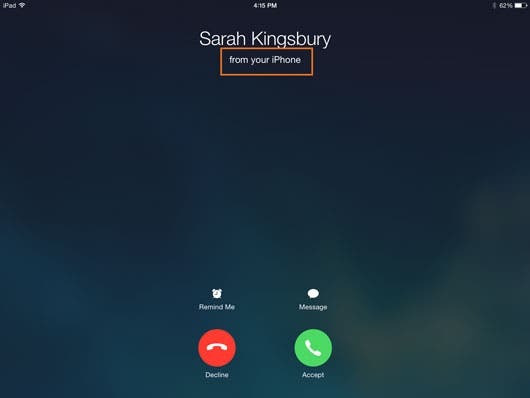 You will now be able to make or receive calls on your iPad or iPod. To make a call on your iPad or iPod, you will only be able to call phone numbers already in Contacts, Safari, or Calendar. It seems pretty ridiculous that there is no dial pad available on the iPad or iPod to go with the Continuity Phone Call feature, but you will have to add a new number to Contacts in order to call it. Please note that your iPhone will have to be in the same building in order for you to take or make a call on your iPod or iPad, since both devices will need to be on the same Wi-Fi network.